It’s been an amazing journey for nine members of the Boys & Girls Clubs of Chicago. With 19 Clubs throughout the city of Chicago, the nonprofit organization inspires our city’s youth to develop character, leadership, and a willingness to serve their Clubs and community. Every year, the individual Clubs nominate one exemplary member to compete for the title of Boys & Girls Clubs of Chicago’s Youth of the Year. The Youth of the Year Award is the organization’s highest local honor; rewarding leadership, service and academic standing. The competition gives us a rare glimpse into the lives of Chicago’s youth positively affected by the Boys & Girls Clubs of Chicago, and provides an opportunity to celebrate the success of its members, the efforts of its staff and volunteers, and the powerful impact of its programs. 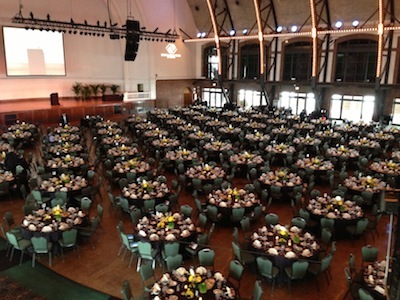 The Youth of the Year Award competition includes several steps along the way, culminating in a public speech, which was held at a Navy Pier event. Those in attendance included Mayor Rahm Emanuel. The purpose of the video was to show attendees what the nominees face in their individual neighborhoods, what they did to prepare for the speech, and how the Clubs impact their lives. We filmed at four of the organization’s Clubs, filmed b-roll of various preparations for the competition, and conducted eleven interviews. Our services also included a local TV news station b-roll drop for local newscasts. When the video played at the Navy Pier event to over 900 people, it received a huge round of applause (and even some tears). It has been an amazing journey and we want to congratulate Evelyn from the Cotter Club for winning the award! To watch a recap video of the Youth of the Year event, CLICK HERE.